Parking enforcement workers Lew Dyer IV (left) and Travis Spencer have been working vigorously this week to mark cars and write parking tickets, with more than 100 written by Thursday afternoon. "It's a crackdown, I guess," Dyer said. That’s the word locals were using this week to describe the city’s new efforts to eradicate a longtime problem that has become more troubling as the weather warms up: parking scofflaws who hog the good downtown spaces for too long and don’t pay the tickets they rack up. “It was an issue that needed to be taken care of,” Chief Mike McFadden of the Belfast Police Department said. By Thursday afternoon, the city’s two summer parking enforcement workers had placed well over 100 yellow tickets on the windshields of cars that had parked longer than the two hours that’s generally allowed by the city’s parking ordinances. Although overtime parking tickets in Belfast are just $5, only half of the recipients ever bother to pay them. And the money owed the city adds up. McFadden said that since 2006, the figure is roughly estimated to be more than $11,000. The top offender, whom police declined to name, owes $219 in parking tickets. “It’s real money,” the chief said. The tickets — and the money at stake — have become more problematic as Belfast’s downtown has filled up with more businesses and more tourists. 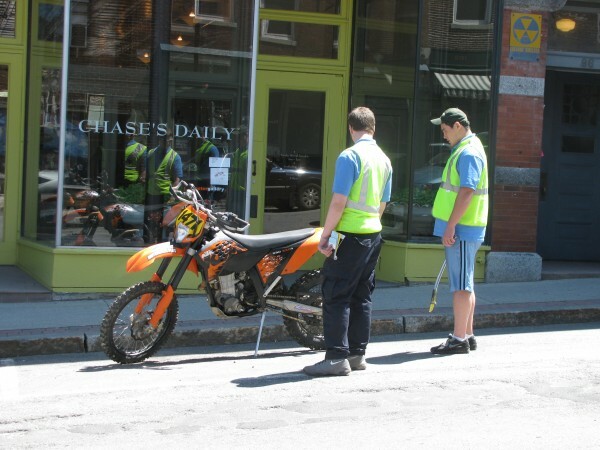 Garry Conklin, owner of Conklin’s Maine Mercantile on High Street, said that he has been dismayed in recent months to see the parking spaces immediately in front of his business monopolized by people who work downtown. Some people who might stop and shop don’t bother if they can’t find parking quickly, he said. He began to ask downtown workers if they could park elsewhere and generally received a cold shoulder. But since the parking crackdown began, Conklin’s bottom line has been perking up. Thursday evening, a couple from California pulled up to an empty space in front of the store just before closing time, and they shopped long enough to become his best sale of the day. The owner thinks that he wouldn’t have made that sale if the parking hadn’t been readily available. City councilors, some of whom have received complaints about the downtown parking situation from constituents, have been talking about how to fix the problem. That change likely will involve making tickets more expensive, looking into getting a device like a boot to clamp the tires of frequent offenders or towing and impounding their vehicles. The city also will look into ways to give people an incentive to pay their tickets. In some municipalities, more fines are assessed if parking tickets go unpaid for too long. Not in Belfast, however. “I don’t fully understand how we’re supposed to go after people who don’t pay their parking tickets,” McFadden said. He said that when the city of Rockland had its own parking ticket crackdown in recent years, there was $50,000 worth of outstanding tickets. That kind of quick response means that it’s locals and not tourists who tend to be the worst offenders, he said. Parking enforcement workers Travis Spencer and Lew Dyer IV, who are spending their summer college break marking car tires with chalk and writing tickets, said that they’ve already noticed that locals are finding other places to park. “There’s definitely not as many cars,” Spencer said. McFadden added that even with parking tickets remaining a cheap $5, the city has already seen about a quarter of those issued this week paid. “Even if they’re $5 tickets, people don’t want them,” the chief said.